All of Barstow’s Farm Raised Beef is frozen in vacuum sealed plastic packaging. This makes shipping and storing easier for the Barstow family and our staff – but what about for our customers!? 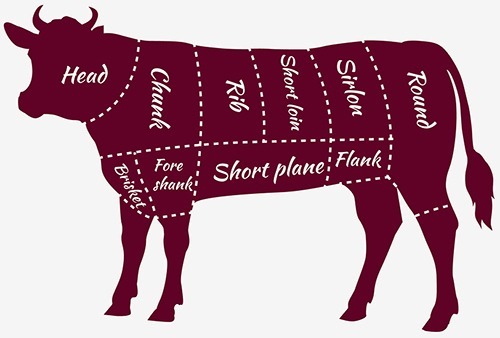 Keeping our beef frozen guarantees you will receive the freshest cut of meat! Frozen beef also means it will keep for longer in your freezer at home, allowing you to take advantage of our great discount – buy 10 pounds of beef, get 10% off your purchase! Best Way: Thaw in the refrigerator 24 hours before you plan on cooking it. Either in its packaging or wrapped with plastic wrap (place a plate underneath in case it leaks!). Ground beef will be safe in the fridge for an additional two days after defrosting. Steaks, roasts, and other cuts keep for 3 to 5 days. In a Pinch: Thaw in cold water in your sink. Change out water every hour to ensure it stays cold – it might take 2 to 3 hours to defrost. If you defrost and then decide not to eat it that night, make sure it is cooked thoroughly before placing back in refrigerator or freezer. The Very Last Minute: Thaw in the microwave without any packaging and on a clean plate. Keep an eye on it to make sure the meat doesn’t start actually cooking which will result in a sort of rubbery texture later. If you defrost and then decide not to eat it that night, make sure it is cooked thoroughly before placing back in refrigerator or freezer. How long can I keep my beef?